We were nervous about purchasing online, but we are very happy with the results! 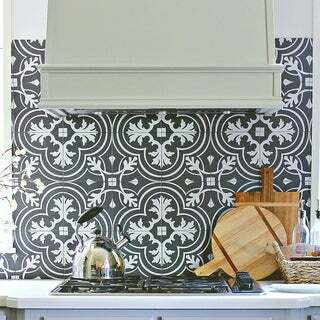 We were looking for a cement tile look without the thickness of a cement tile—and this worked great! Love the pattern! Bought this tile for my laundry room, small space about 6 x 8. Needed about 6 cases so the pattern all matched up, and it came out beautifully. Works really well with an off-white/ light grey grout and wainscoting. I used this tile on the wall of a kitchen in the "Urban Farmhouse" feature home that I did at the Great Big Home + Garden Show in Cleveland, OH. NEVER has a tile gotten so many rave reviews! Out of all thousands of people that toured the home, I heard not one negative comment on this stunning tile! GET IT! Love the tile. It's great quality and looks amazing in the bathroom. Was very easy to install once you get the pattern laid out in advance. I used it as a tile wainscoting. Looks great! We were looking at this tile from Home Depot but it was constantly sold out so we took a gamble and ordered it here. It is a little thinner than the one sample we had previously but so far it looks good on the floor. Our contractor said he was worried it may break easily if something drops on it but so far it has been wonderful. It is beautiful and we have received several compliments. Not one tile was cracked or broken! I was very impressed with the way these were packed. The color is a bit muted- I thought it would be a darker black. I decided to not use them for my backsplash, but move them to my new bathroom floor. I'd order tile again from O.